The 8-bit Programmable Computer illustrates how a hierarchy of macro blocks can easily manage large designs using primitive, MSI and other macro parts. 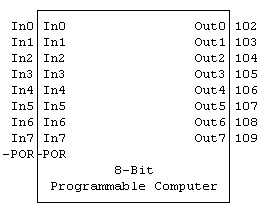 The 8-bit Computer macro was built from the 8-Bit Programmable Computer circuit, which in turn was built from nine other macros. A brief description of each of these nine macro blocks follows. Schematics of all macros are in the Logic Design Draw/Logic Simulator Examples: Computer "Macro Schematics" directory. The Timing block contains an oscillator and a divide-by-5 Johnson counter. Six timing terms, A -A B -B C -C, are provided to sequence control logic. For the 8-bit Computer, only A and -C are used. 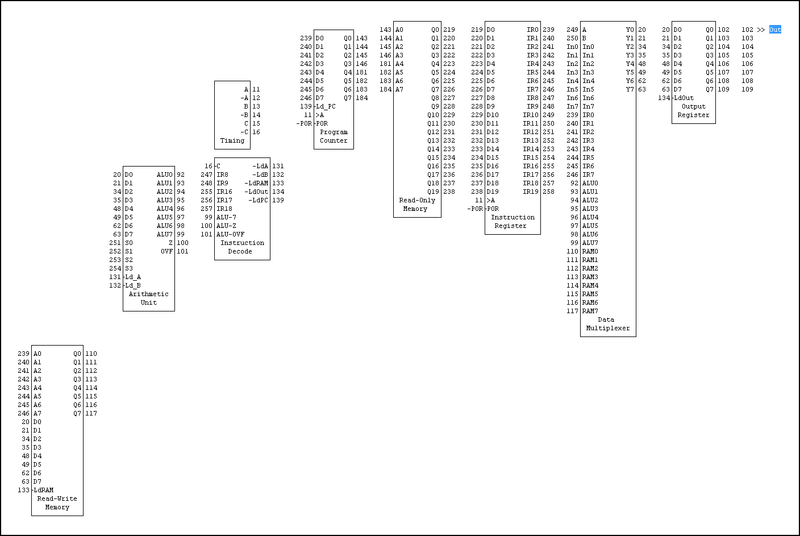 The Program_Counter (PC) is an 8-bit counter which sequences up to 256 computer instructions in the Read-Only Memory. Normally the PC starts at a count of 0 and increments after each instruction is executed. For Branch/Jump instructions, the PC is loaded by the Branch address. The 256-word by 20-bit Read-Only Memory consists of (5) 256x4 ROM4 parts and contains the computer program. The data in these ROM4 parts must be defined before simulation. To change the program, the Read-Only Memory circuit must be edited and the macro must be rebuilt. For each instruction cycle, the Instruction_Register latches the instruction data from the Read-Only Memory. The Data_Multiplexer selects one of four 8-bit inputs and generates an 8-bit data output which can be used to load the Arithmetic_Unit, Read-Write_Memory, Output_Register and Program_Counter. The Read-Write_Memory, which consists of two RAM4 parts, provides 256 8-bit words of read/write memory. The Arithmetic_Unit has two input registers (A, B) and an 8-bit Arithmetic-Logic Unit (ALU8). The ALU8 part supports a total of sixteen signed-integer-arithmetic and bitwise-logical operations. 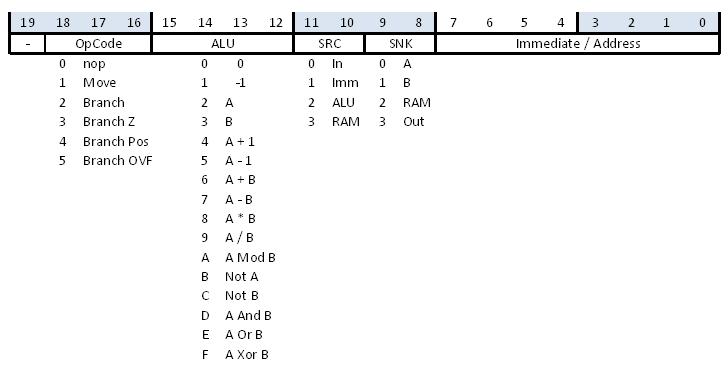 It is similar to the 4-bit LS181 ALU, but ALU8 is an 8-bit part and additionally has multiply, divide and mod/remainder operators. It has two 8-bit inputs, A and B, and a 4-bit function select (S) input. 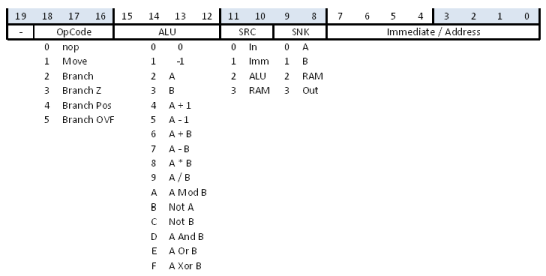 Refer to Logic Parts Data for a full description of ALU8. The Output_Register provides the output of the Computer. It can be loaded under instruction control by any input to the Data Multiplexer.